We are a healthy eating family, mostly by necessity but let's face it, nothing quite matches the culinary delight of a freshly cooked chip smothered in salt and vinegar, or perhaps dipped in mayo or ketchup (or mustard, or brown sauce, or mushy peas - daddy's fave! Or chocolate sauce - No Charlotte, not chocolate sauce!) or dipped in your drink in fact. But when the little girl finds that marvellous prize, a massive perfectly cooked prince amongst pomme frittes, "The BEST chip" it's definitely cause for celebration. A riotous rhyming celebration of everyone's guilty favourite food, chips glorious chips! Absolutely belting to read aloud, pitch perfect, it's almost as satisfying as...well, a huge bag of chips! Agh, the only problem is that now we're really craving chips for dinner AGAIN!! Charlotte's best bit: When the little girl drops the best chip on the floor. CATASTROPHE! Whatever will she do? Daddy's favourite bit: We talked recently about the need for perfect rhyming and this book absolutely nails it. Such fun to read aloud, and who could resist a subject like this. Brilliant stuff Kate! 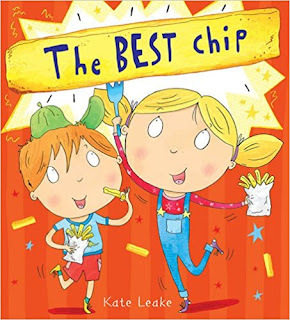 "The Best Chip" by Kate Leake is out now, published by Alison Green Books.